I am the queen of the "let's buy some expensive tool and let's leave it untouched for several months". Yes, I am. 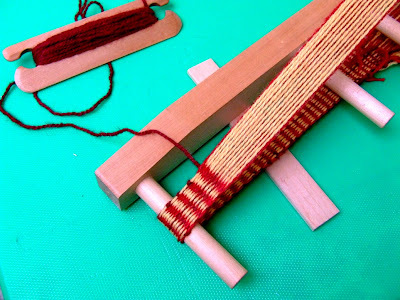 This is the first attempt with a simple wool band, a short one just to get the hang of the weaving on this loom. 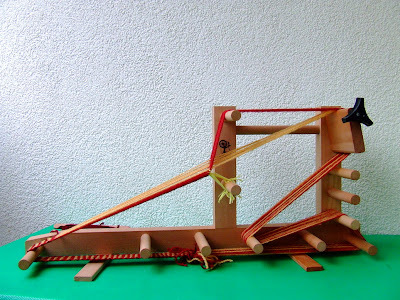 I like this heddle weaving-without a heddle, because there is no wooden heddle here, just some pieces of string that play its role. I also gave Shrinky Dinks a try (a present from Myriam, yikes! *^v^*). I couldn't decide what to choose so I just picked three simple drawings from the Gimp brushes and voila! I cannot believe you've had such a great toy since the 70's in the US, whereas we haven't! Your shrinky dinks are cute. Isn't it amazing how small they get. Can't wait to see your paintings and TYC. 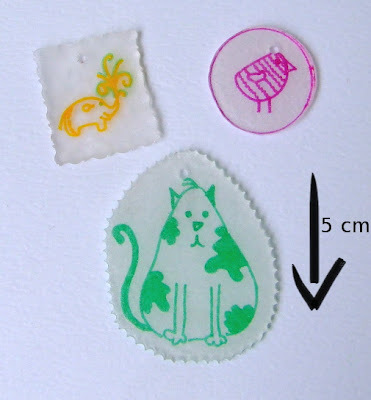 isn't it fun to watch the shrinky dinks shrink!